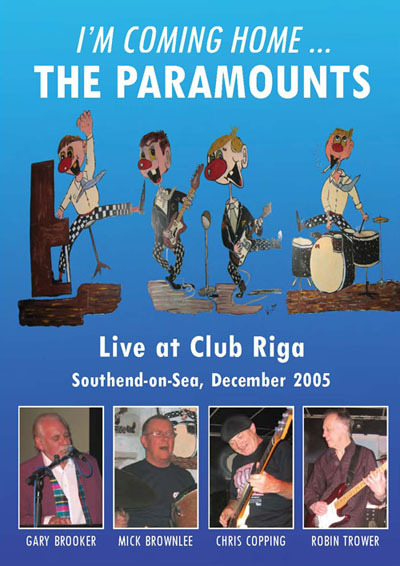 Sixties’ R’n’B legends The Paramounts – in their original line-up of Gary Brooker (voice and piano), 'Little Mick' Brownlee (drums), Chris Copping (bass, all the way from Australia) and Robin Trower (guitar) – came together at Christmas 2005 for one glorious night’s reunion in Southend. Brooker, Copping and Trower had last played together, in Procol Harum, in the early 1970s of course. Their home crowd (reinforced by an international following) gave them a rapturous welcome. The sold-out show – played in front of the original painted cartoon that hung in The Shades club – was filmed off-the-cuff as a memento for the players: but music and atmosphere of this calibre cry out to be shared with fans worldwide! The BtP team has worked closely with Mick and Gary to bring this about. Gary, Mick, Chris and Robin have authorised a limited-edition release of what is, effectively, their own home-movie, their souvenir of this unique musical event. The modest price reflects the fact that it's not professionally filmed, but there were two cameras on the job, so close-ups alternate with long-shots, and Dave Bronze has worked on the phonic side of things so that – while it's not Dolby 5.1 etc – it does sound really good. This is what The Paramounts played: Old Black Joe (Stephen Foster) • Rock Me Baby (BB King) • Youngblood (Jerry Leiber / Mike Stoller) • Stay (Maurice Williams) • Blackjack (Ray Charles) • Poison Ivy (Jerry Leiber / Mike Stoller) • Ooh Poo Pah Doo (Jessie Hill) • Walking to New Orleans (Dave Bartholomew / Fats Domino / Pearl King) • What’d I Say (Ray Charles) • Saint James Infirmary (Joe Primrose) • Draw Me Closer (Doris Payne / Greg Carroll) • Breathless (Otis Blackwell) • Lucille (Al Collins / Richard Penniman) • Santa Claus is Back in Town (Jerry Leiber / Mike Stoller). On the DVD you will also find the usual banter and backchat between band and audience, and it's clear that everyone is richly enjoying themselves and the unique occasion. The world's only outlet for 'I'm Coming Home ...' is the BtP shop: click here to order, while stocks last – but make sure you order the correct format (Region 2 PAL to play in Europe, Region 1 NTSC to play in USA) as we can't make refunds if you get it wrong! The DVD will NOT ship until after release party on 20 August, during the Palers' Revels in Denmark on Sunday 20 August; if you are coming to this (the Procol Harum aftershow celebrations) you can order the DVD and select 'Pick-up Rate' as shipping method. That way you will not be charged for postage, and can collect your DVD at the celebrations.